I’ve been living with Martin Heidegger for a while now. Longer, I suppose, than I could accurately tell. At some point, maybe ten or so years ago, I turned to Heidegger and since then I have been unable to get away from him. And, as if to intensify that truth, I don’t think I’ve made much of an effort to get too far away from Heidegger. My attraction to Heidegger (which is always complicated by Heidegger’s past, by what he did as much as what he did not do) is easily explained: more than anyone else, Martin Heidegger makes me think. Together with Hamlet and Beyond a Boundary, Heidegger’s Was Hei§t Denken? is one of my favorite books. An odd triumvirate, I grant you. And yet not. In some way, they all make the same demand of me, persist with the same question: What kind of work does it take to be an intellectual? “Thou art a scholar, speake to it, Horatio,” Marcellus implores his fellow soldier. Horatio’s ability to speak Latin, Marcellus is convinced, will allow him to commune – communicate – the ghost of the dead king. “I was a British intellectual before I was ten,” says James. Shakespeare, C. L. R. James, and Heidegger, bound for me by their injunction to think. Nothing matters more. That is why I’ve taught a course on Was Hei§t Denken? a couple of times. Every time I read or teach it, every time I quote from it, I learn more – more, I should say, than I could possibly have imagined. You could say, then, that I’ve lived with Was Hei§t Denken? for a good while now. And if you live with a book, if it occupies so much of your time, an intense relationship develops. Part of that relationship, part of that intensity, provokes—in me, anyway—the desire to write about that book. Problem is, I’ve never quite figured how to do it. I was, you could say, ready to write about Was Hei§t Denken? a while before I actually sat down begin Martin Heidegger Saved My Life. In so many ways, I was ready to take up the challenge of thinking that Heidegger issues in Was Hei§t Denken? Here’s the thing of it. You don’t know you’re ready until you find yourself prepared to think in the moment – in the moment of what, for you, feels like the moment of record. That moment upon when something very important, your sense of who you are, how you are in the world (let’s just call it being/Sein, shall we? ), hangs in the balance. Turns out that all it required was a white woman approaching me, a black man raised in apartheid South Africa, to ask if I wanted another job while I was raking leaves outside my home. Who’d a thunk it? (to render Heidegger in a vernacular that would have been wholly unacceptable to him). 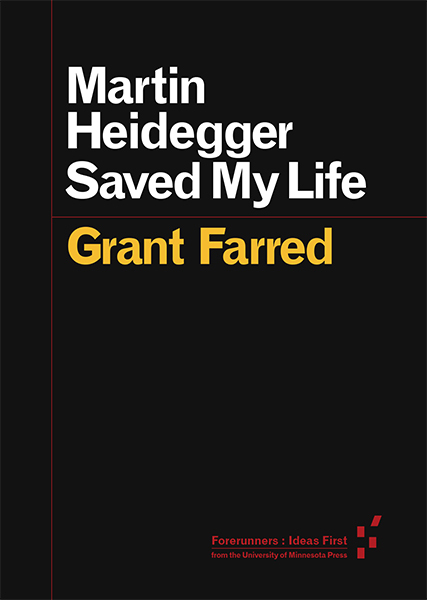 My idiomatic indulgence notwithstanding, in the moment of record, Martin Heidegger came to me and, as I so grandly proclaim, Martin Heidegger saved my life. 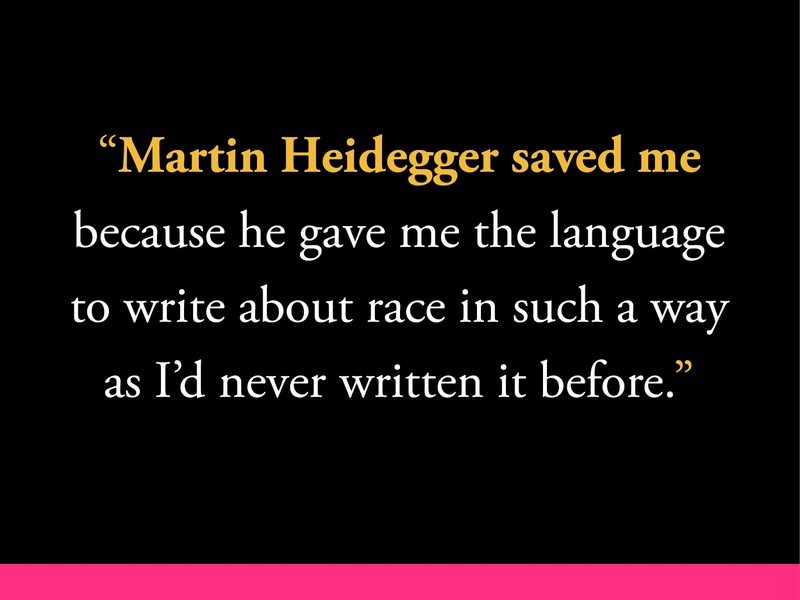 And Heidegger saved me because he gave me the language to write about race in such a way as I’d never written it before. Heidegger enabled me to write in this way because he has made me think about how to think. Of all the philosophers I know and the theorists I read, Heidegger stands apart because he is the only thinker I know who explicitly sets himself the task of thinking thinking. This is, above all else, what draws me to Heidegger: to ask myself, again and again, what it means to think. And thinking, in Heidegger’s rendering, is nothing other – in other words, it is everything – than asking oneself what it means to be an intellectual. It is all good and well to insist, as I have done, that the work of an intellectual is simple, straightforward: to think. It is entirely another matter to confront oneself with the question of what thinking is – this is the kind of question that can take over your life. And because it overwhelms you, it can, in the most crucial moments, also save you. Maybe it is all that can save you. And this is what Heidegger gave me, gives me: the injunction to think gave me the capacity to imagine an entirely new way to write race, to critique racism. I could write it as my attempt to think thinking. Heidegger, if I might be so bold as to proclaim, freed me from any strictures. He released me, not fully, but enough, from my experience as a disenfranchised South African; he liberated me from my antipathy to racism in America; and he allowed me to write in such that a way that could, I hope, register my utter dislike for the screed as well my discomfort with identity politics. 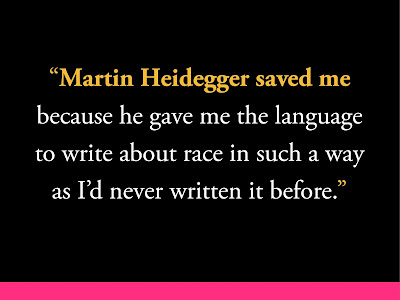 Heidegger liberated me to write race as the act of thinking. Thinking as a singular philosophical and political demand. Thinking, again, now leavened, modulated and, yes, inspired by the experience of having to write thinking. On my own terms, in my own language, closely observed by the ghost that is Martin Heidegger. “I wish to speake to you, Martin, as a scholar.” Or, “Because of you, Martin, I strive to be a scholar.” Or, “I wish to think as a scholar should, Martin.” I try to think with you, because of you. Because of Martin Heidegger, I understand what I tried to undertake in Martin Heidegger Saved My Life. I tried to think what it means to write race, I struggled to think my way to my own writing of racism. At once strange and salient that it is, Martin Heidegger, whose politics I abhor, who has taught me what it means to think, who demands that I never stop trying to think thinking. If James, anti-colonial critic par excellence, was a British intellectual before adolescence, does that mean that I have been making myself a Heideggerian intellectual, with all its possibilities and discomfitures, in my middle years? Grant Farred teaches at Cornell University. He is the author of several books, including the Forerunners series title Martin Heidegger Saved My Life (2015), In Motion, At Rest: The Event of the Athletic Body (2014), and What's My Name? Black Vernacular Intellectuals (2003).